In late November 1773, the Nantucket whaling ship Dartmouth sailed into Boston harbor. Her cargo was tea, brought back from England after sailing there with a load of whale oil. 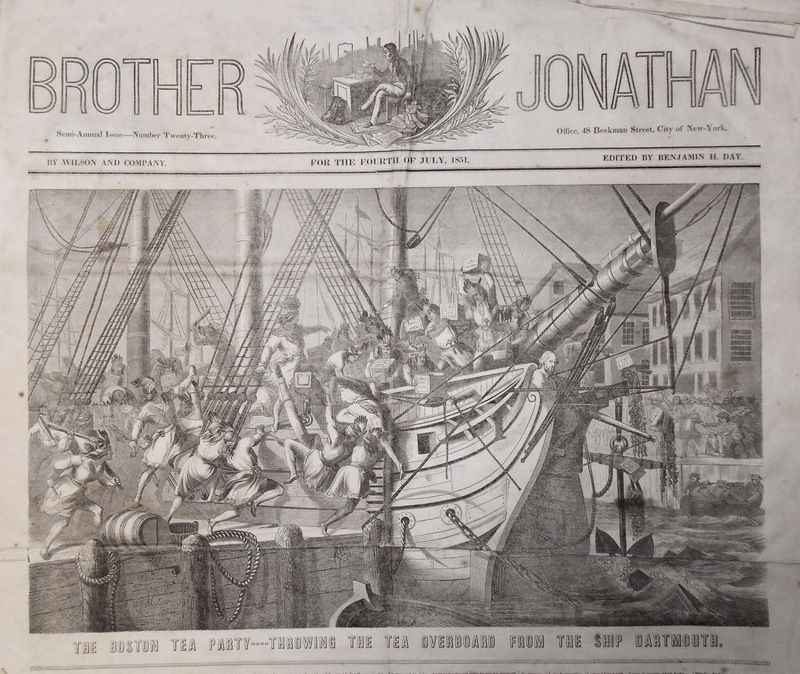 At the time, much of the population of Boston had gotten a tad irritable about British taxation and duties on tea, so the Dartmouth was not allowed to unload her cargo. A few days later she was joined by the Eleanor, also loaded with tea and similarly detained in the harbor unable to unload. On December 15th, the Beaver arrived, and became the third ship that would, the next day, play a role in one of the pivotal events in this country’s fight for independence. We all know what happened to that tea in Boston harbor on December 16, 1773. However, I had forgotten from my American history lessons of long ago that one of the Boston Tea Party ships was named Dartmouth. She was the first ship built in New Bedford, Massachusetts, in 1767 for Francis Rotch of Nantucket, and was named for a section of Bedford. Sadly, the Dartmouth was lost at sea on the Atlantic during the summer of 1774. There have been other ships named Dartmouth, including a brig built by J. N. Harvey in 1768 and listed in Lloyd’s register of shipping for 1776. It was this vessel that caused some confusion over the rigging when Ruth Edwards was researching the Boston Tea party ship Dartmouth for a commission she had been given by the Class of 1907. The class gave the painting of the Dartmouth to the College in 1967 in honor of its upcoming bicentennial. During World War II, an oil tanker, the Dartmouth, and a victory type cargo ship, the Dartmouth Victory, were launched. About the same time, two liberty cargo ships were launched: the Samson Occom and the Eleazar Wheelock. I suspect there are other ship with Dartmouth connections, but the vessels carrying the name of Levi Woodbury, Class of 1809, and Secretary of the Navy, are too numerous to go into here. Ask for Iconography 1368 to see the "Tea Party" Dartmouth. There are two conflicting stories in my family about my ggggrandfather, John Staples: (One)) he invested all his inheritance on tea aboard the Dartmouth which was dumped and lost in Boston harbor or (two:) the ship he was on was wrecked off the coast of Maryland in 1773 or4, and he landed at Annapolis. Would you know any more about the Dartmouth which was wrecked "in the Atlantic"? Thanks for your comment; we apologize for not catching it sooner. We've forwarded your question to the staff at our Rauner Special Collections Library for a response.